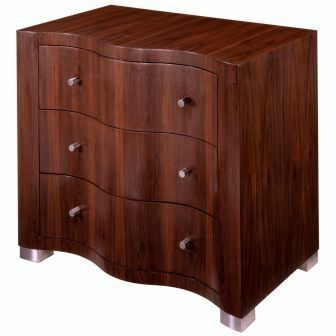 The Atherton Chest is an elegant, monolithic design that features an undulating curved surface over the entire front face. Hand cut veneers have been carefully matched to create a striking waterfall effect of cascading wood grain. The drawer pulls and feet are satin stainless steel. The woods used in the creation of this design are typically FSC certified as being derived from sustainable sources. The Atherton Chest is also consistent with the sustainability standards set out by the U.S. Green Building Council's stringent LEED (Leadership in Energy and Environmental Design) program, namely the MR-7 Credit for certified wood use; the EQ Credit 4.1 for Low Emitting Solvents and Materials; and the EQ Credit 4.2 for Low Emitting Materials, Paints and Coatings.